A coveted eyelash service. Full. Fluffy. Voluminous & Lush. They are the longest lasting eyelash extensions. Incorporating a pristine method in which 2-6 super fine, super lightweight extensions are applied per natural lash. Your lash doll hand makes each bouquet, carefully fanning out multiple lashes using their tweezers right before attaching them to your lashes. The procedure is very delicate and much more intricate as absolute precision is a necessity. MEGA Volume is the upgrade to the already popular "Russian Volume" We utilize even lighter thinner lashes. An advanced technique that allows us to give your lashes up to 16 Dimension. Volume lashes can be worn by anyone. What makes this technique so amazing is the utilization of extremely thin and light lashes. This allows for individuals with even the sparsest, finest lashes to achieve considerable volume and finally have lush lashes who normally can not carry the weight of classic lash extensions. A must for weddings and special events. 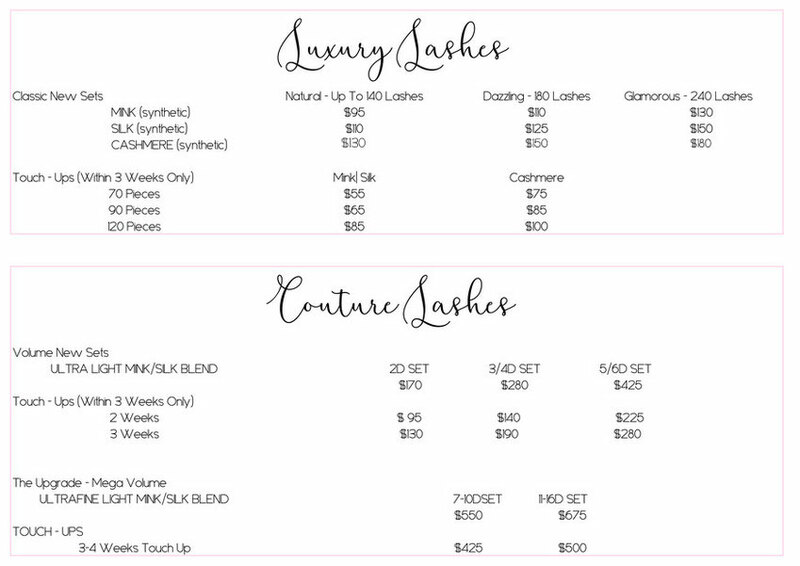 The main advantage of the volume technique is that, it has made it possible to give full, voluminous sets of lashes even if you have sparse, fine lashes naturally. In comparison to classic extensions, the finish is much softer, fluffier, and multi dimensional. Due to the light weight of the extensions, it has been known to last longer than classic extensions on most clients. Depending on how much volume and dimension you desire, it can take anywhere from 2-5 hours to complete. Please, no caffeine or alcohol before the service. The newest trend in the lash industry! The innovative, moulded shape of Cashmere Extensions provides a multitude of benefits over the traditional mink and silk lashes. Cashmere Extensions look just as lush as classic extensions without the weight due to their ellipse profile. Less weight means less strain on your natural lashes encouraging a longer stay. The concave contour of Cashmere Extensions hugs your natural lashes from side to side. Thanks to the greater surface contact area, cashmere extensions provides a stronger, longer-lasting bond. (Think big bear hug vs. peck on the cheek). Cashmere Lashes are thinner from top to bottom which makes them more flexible and are extremely soft to the touch. Despite their delicate structure, curl retention is twice as strong.